Melinda Jane Symons, daughter of George Symons and Martha Melinda Dennis was born on 10 Jul 1890 in Beaconsfield, Tasmania, died on 9 Oct 1966 in Launceston at age 76, and was buried in Perth. 1-John Symons. John married Elizabeth. They had a son, John, and in the 1841 census they were living at Lower Street, East Looe, Cornwall. 2-John Symons was born about 1833 in Liskeard, Cornwall, England and died in May 1870 in Cornwall, England aged about 37. John married Mary Jane Milford, daughter of George Milford and Elizabeth Phillips, about 1857 in Cornwall, England. Mary was born about 1839 in St Austell, Cornwall, England and died on 27 Sep 1923 in Zeehan, Tasmania aged about 84. They had four children: Elizabeth Jane, Susan, George and Matilda. 3-Elizabeth Jane Symons was born on 31 May 1858 in St Cleer, Cornwall, England and died on 18 Nov 1927 in Hungerford, Hastings, Ontario, Canada at age 69. Elizabeth married James Moyle, son of William Moyle and Mary Roberts, in 1875 in Liskeard, Cornwall, England. James was born on 1 Mar 1854 in Wendron, Cornwall, England and died on 22 Nov 1923 in Hastings, Ontario, Canada at age 69. They had three children: Matilda Jane, James and Mabel Alice. 4-Matilda Jane Moyle was born in Jul 1877 in Llanengan, Caernarvonshire, Wales and died in 1967 in Quebec, Canada at age 90. Matilda married William Burgoyne in 1906 in Minton, Quebec, Canada. 4-James Moyle was born on 21 Feb 1880 in Llanengan, Caernarvonshire, Wales and died on 23 Dec 1961 in Timmins, Cochrane, Ontario, Canada at age 81. 4-Mabel Alice Moyle was born on 27 Feb 1885 in New Jersey, Unites States of America. 3-Susan Symons was born in 1860 in St Cleer, Cornwall, England and died on 30 Jun 1927 in Launceston, Tasmania at age 67. Susan married David Shields, son of George Shields and Isabella Buchan Mowatt, on 16 Feb 1887 in Launceston, Tasmania. David was born on 28 Sep 1859 in Launceston, Tasmania and died on 20 Oct 1917 in Launceston, Tasmania at age 58. They had four children: David Mowatt, Audley Milford, Tasman Milford and Stanley Trevor. 4-David Mowatt Shields was born on 17 Nov 1887 in Launceston, Tasmania and died on 6 Sep 1972 in Launceston, Tasmania at age 84. 4-Audley Milford Shields was born on 4 Nov 1891 in Launceston, Tasmania and died on 25 Jan 1893 at age 1. 4-Tasman Milford Shields was born on 21 Mar 1894 in Launceston, Tasmania. 4-Stanley Trevor Shields was born on 15 Jul 1904 in Launceston, Tasmania and died on 7 Jan 1957 in Launceston, Tasmania at age 52. 3-George Symons was born in 1863 in Liskeard, Cornwall, England and died on 13 Jan 1941 in Perth at age 78. George was a child coal miner (pit boy) in Cornwall. He emigrated to Tasmania, arriving on the SS Gulf of Carpentaria which sailed from London 10 Dec 1883 and arrived 3 Feb 1884. He was accompanied by his mother Mary Jane Moyle, William Moyle (7), Susan Symons (16), and Matilda Symons (13). All were protestant and could both read and write. His mother's second husband (and his stepfather) was already in Tasmania. He first worked mining at Gormanston. He moved to Beaconsfield when gold was discovered and by 1913 he was farming at Turners Marsh. He gave up mining on doctors’ advice and became a farmer at Turners Marsh. When courting Martha Dennis he was living in Beaconsfield and she was in Perth. He would walk the whole way to see her, refusing a lift on a horse and cart because they were too slow and took too long. MR. GEORGE SYMONS Turner's Marsh has lost one of its oldest and most respected residents by the death of Mr George Symons, of Berwen Banks. Mr. Symons, who was born at Liskeard, Cornwall, England, came to Tasmania in 1883 at the age of 19 years. After visiting various places, he settled in Beaconsfield, working in the Tasmania gold mine for about 12 years. He married Miss Martha Dennis, the second eldest daughter of William and Sophia Dennis, of Perth, Tasmania. In 1897 he decided to take up farming, and went to Turner's Marsh, where he bought the property on which he has since lived for over 40 years. Mr. Symons is survived by his wife and family of five daughters and two sons. The eldest son was killed in the Great War. The funeral took place at Perth General Cemetery on Tuesday. Rev. A. R. Gardner conducted the burial service. Funeral arrangements were carried out by Mr. C. T. Finney, A.F.D.A. George married Martha Melinda Dennis, daughter of William Dennis and Sophia Peachey, on 25 Dec 1888 in Launceston, Tasmania. Martha was born on 21 Dec 1865 in Longford, Tasmania and died on 30 Dec 1946 at age 81. They had eight children: George Milford, Melinda Jane, Winifred, Matilda Sophia, Jessie, William John, Victor James and Lillias Martha. 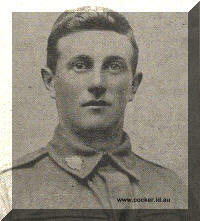 4-George Milford Symons† was born on 17 May 1889 and died on active service on 20 May 1918 in France at age 29. 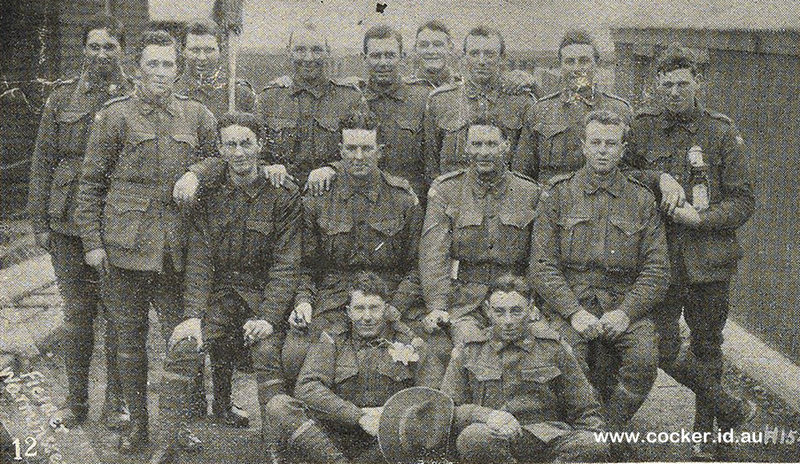 He enlisted in October 1916 and joined 12th Battalion, 25th Reinforcement, embarking from Sydney, New South Wales, on board HMAT A20 Hororata on 14 Jun 1917. 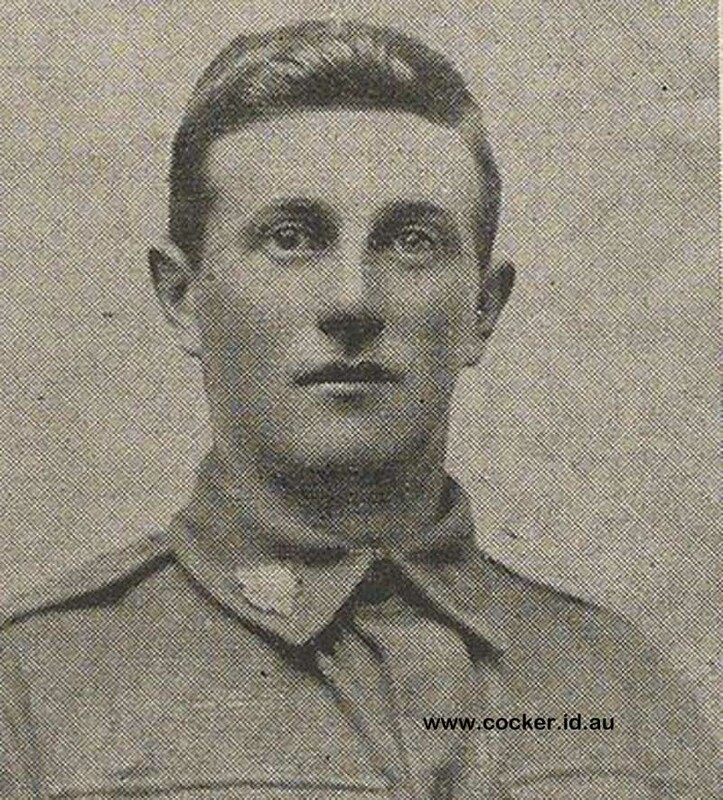 He was admitted to the 3rd Australian Field Ambulance on 111 May 1918 suffering from mustard gas poisoning and transferred to the 8th Stationary Hospital, Wimereux, France where he died on 20 May 1918. He was buried in the Bologne Eastern Cemetery (Plot IX, Row A, Grave No. 74), France. 4-Melinda Jane Symons was born on 10 Jul 1890 in Beaconsfield, Tasmania, died on 9 Oct 1966 in Launceston, Tasmania at age 76, and was buried in Perth General Cemetery. Melinda married Walter Eardley Harris, son of Alfred Harris and Annie Florence Taylor, on 29 Apr 1925 in Invermay, Launceston. Walter was born on 6 Aug 1902 in Pateena, died on 19 May 1973 in Perth at age 70, and was buried in Perth General Cemetery. They had three children: Vera May, Reginald and George. 4-Winifred Symons was born on 31 Mar 1892 in Beaconsfield, Tasmania. Winifred married Douglas Croome Smart, son of George Ellis Douglas Smart and Emma Croome, on 24 Mar 1926 in Turners Marsh, Tasmania. Douglas was born on 6 Aug 1889 in Perth and died on 27 Jul 1983 at age 93. They had a daughter: Jessie Lena. 5-Jessie Lena Smart. Jessie married Hinton Charles Lloyd, son of Leslie Charles Lloyd and Edith Margaret Pitt, on 11 Aug 1951 in Launceston, Tasmania. Hinton was born on 4 Jun 1927 in Longford, Tasmania and died on 30 Dec 2003 in Hobart, Tasmania at age 76. 4-Matilda Sophia Symons was born on 6 Jul 1896 in Beaconsfield, Tasmania. Matilda married Beale. 4-Jessie Symons was born on 6 Mar 1898 in Beaconsfield, Tasmania. 4-William John Symons was born on 17 Oct 1903 in Turners Marsh, Tasmania, died on 20 Nov 1991 in Launceston, Tasmania at age 88, and was buried on 22 Nov 1991 in Launceston, Tasmania. William married Ivy Victoria Manning, daughter of Edward Manning and Martha Bounds, on 3 Jan 1935 in Longford, Tasmania. Ivy was born on 16 Dec 1905 in Evandale, Tasmania, died on 20 May 2001 at age 95, and was buried in Launceston, Tasmania. They had four children: Joy Martha, Marjorie Joan, Jessie Naldera and Michael John. 5-Joy Martha Symons was born on 7 Jan 1936 in Nurse Hodges, 25 Canning Street, Launceston. Joy married Glen Graeme Neal, son of Herbert Daniel Neal and Elizabeth Myrtle Diprose. They had a daughter: Denise. 5-Marjorie Joan Symons was born on 29 Aug 1937 and died on 13 Nov 2011 at age 74. Marjorie married Kevin Mervyn Lockett, son of Mervyn Walter Lockett and Camelia Mary Matthews, in 1960. Kevin was born on 9 Dec 1928, died on 27 Jan 1999 in Launceston, Tasmania at age 70, and was buried on 29 Jan 1999 in Launceston, Tasmania. They had two children: Julie and Rodney. 5-Jessie Naldera Symons was born on 27 Sep 1940 in Naldera Hospital, 25 Canning Street, Launceston. 5-Michael John Symons was born on 30 Nov 1945 in Naldera Hospital, 25 Canning Street, Launceston. 4-Victor James Symons was born on 11 Feb 1905 in Turners Marsh, Tasmania. Victor married Teresa Veronica Flynn, daughter of Owen John Flynn and Nora Adeline, in 1935 in Church of Apostles, Margaret Street, Launceston. They had one daughter: Patricia. 4-Lillias Martha Symons was born on 24 Nov 1910 in Queen Victoria Maternity Hospital, Launceston. Lillias married William Barker. They had one daughter: Beverley. 3-Matilda Symons was born in 1869 in St Cleer, Cornwall, England.